The rain has stopped, the temps are rising, and it’s finally nice enough to head into the studio ALL DAY and play at the tank. That means SPRING MARBLING CLASSES have been scheduled! I’m excited to welcome new and returning students to join me at my studio in South Pasadena to explore the wonderful world of marbling. There is a little bit of everything for everyone, including an OPEN STUDIO (the first in a long time!) option for current and former marbling students. I’m also giving a discount for early-bird sign ups so be sure to register for class by Friday, April 12 for significant savings! The cost includes bath (one time tank fill), up to 10 paints, alum, distilled water, dispersant and retarder, use of tank and tools, and use of studio space. You bring your own paper (or other materials to marble upon…or purchase from me) and extra paint (if necessary). If you need a refill of bath, there will be an additional charge. Available to my current and former marbling students, I offer open studio time as a way of giving those who don’t have studio space the chance to continue to experience and explore the joys of marbling beyond the classroom ~ and at an affordable price. Open studio is a set time frame where you are free to come and go as you please. Stay for an hour ~ or the entire time (the cost is the same). It’s totally up to you. Your marbling station is set up (bath and alum is already made for you!) and ready for you to use. You just need to mix your paints and alum papers (if you haven’t done so already) and you’re off and marbling! Choose what tank size you want to marble in (11×14 or 20×25). This will be your dedicated tank the whole time. No one else will use it. There is no formal instruction, however, I will be available to answer questions. Open Studio is available ONLY to former or current students of mine. NO EXCEPTIONS. Please be sure to read the Open Studio guidelines on the registration page for complete details. In this 2-day comprehensive class, students will learn the nuts and bolts of the art form, dive into traditional pattern making (foundation and advanced patterns) using the large marbling tank (20x25), and have time for creative exploration. We’ll spend a lot of time discussing troubleshooting, the key to a successful marbling experience. We’ll marble on alternative materials (vinyl, cork, natural materials, and 3D objects) and play a bit with additives. You'll leave with a robust understanding of the art form, dozens of marbled papers and other marbled materials, and the confidence to start marbling at home. This class is fast paced and packed full of information. It is also physically demanding…we are on our feet all day and constantly moving from one end of the studio to the other. We also will be working both inside and outside of the studio so you will be exposed to the elements for brief bits of time (like sun!). But most of all, we have A LOT of fun. Everything is provided for you—carrageenan bath, mordant, distilled water, paints, use of tank and tools, paper and other materials to marble on, and handouts—just show up and have fun! 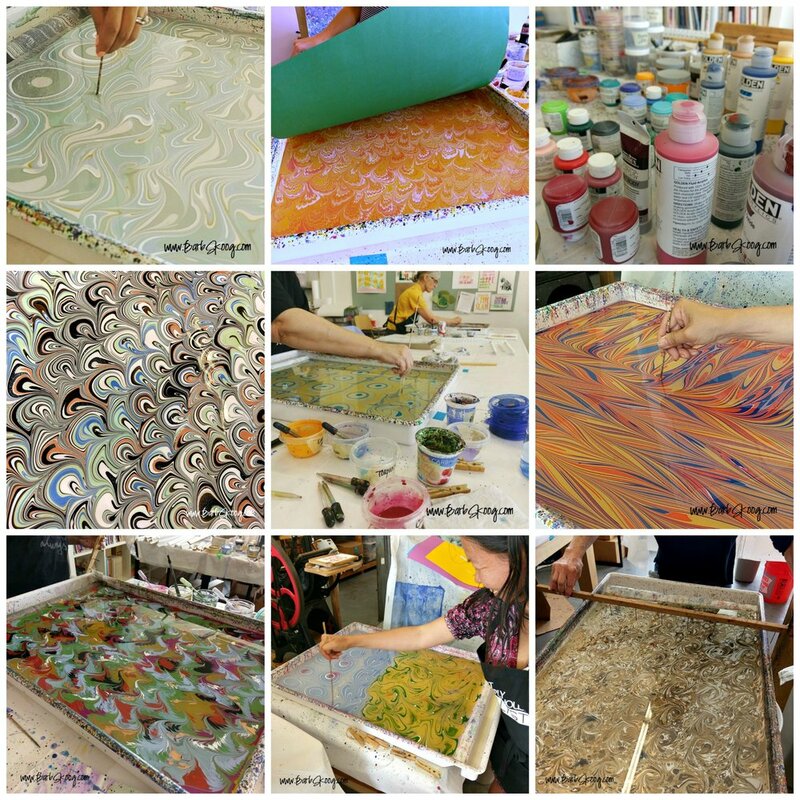 In this hands-on class, we will walk through the marbling set-up step-by-step from making the bath and mordant to mixing paints and preparing paper. We then will work in the medium tank (11x14) to learn the five foundation patterns and venture into advanced patterns as time permits with shared access to the large tank (20x25). By the end of class, you will have the knowledge and confidence to start marbling at home…not to mention many beautiful marbled papers! The class fee includes EVERYTHING—paper, carrageenan bath, mordant, distilled water, paints, use of tank and tools, and handouts—just show up and have fun! Marbling on Fabric (7 hours) — prior marbling experience necessary! EARLY BIRD DISCOUNT (sign up by April 12): $265 which includes all materials except your fabric PLUS one-year access to my Marbling on Fabric eCourse (a bonus gift valued at $99)! Cost after April 12: $295 which includes all materials except your fabric PLUS one-year access to my Marbling on Fabric eCourse (a bonus gift valued at $99)! Maximum of 4 students! A very small, semi-private class! In this full-day adventure, each student will work in their own marbling tank large enough to marble individual fat quarters. There will also be a group tank that will fit scarves up to 17x73 or a regular quarter yard of fabric. We will learn how to properly prepare fabric to be marbled upon, cover advanced techniques such as overmarbling and masking, discuss strategics for design, learn troubleshooting solutions, and review post marbling curing techniques. At the end of class, you will have approximately 10-15 marbled fat quarters and 3-5 silk scarves. Prior marbling experience is a prerequisite. You must have taken a class from me or another professional marbler to attend (self-taught marblers must talk with me before signing up to assess level of marbling skills). There is no beginning marbling instruction provided in this class. PLEASE NOTE: All your fabric must be prepared for marbling prior to class. This includes washing, alumming, and an optional ironing. Instructions will be sent to you beforehand and can be done up to two weeks prior to class. The time it takes to prep your fabric varies on quantity but for what you will use in class, you likely will need 6 to 8 hours. 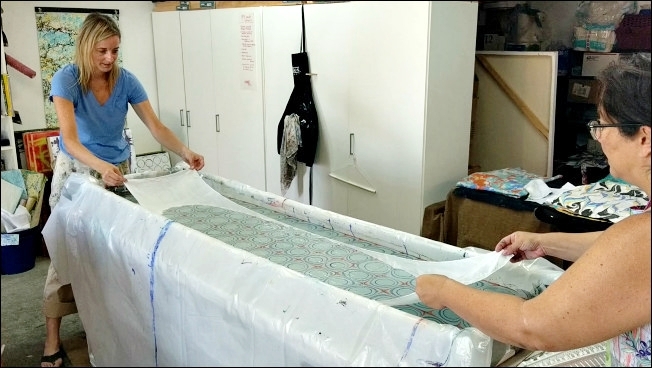 Everything for this class will be provided for you EXCEPT your fabric: tanks and tools, bath, acrylic paints, prepping and post-marbling curing instructions. You just need to bring your prepped fabric and your creative spirit! You also get one-year access to my Marbling on Fabric eCourse (a bonus gift valued at $99)! to receive Early Bird Discounts! If you have any questions, please feel free to send me an email.